Nails, screws, swarf, blasting shot, grinding and foundry dust, off cuts, punchings and many other types of metal waste and debris can damage machinery, floors, plant and personnel. Spread outside they immobilise vital transport, penetrating tyres and causing punctures, usually miles away from base. 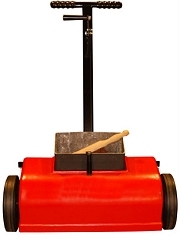 These magnetic sweepers offer an effective and inexpensive solution to all these problems. They are very powerful and will collect all ferrous metals and many grades of stainless steel, from any surface, wet or dry. Workshops and yards can be cleaned thoroughly and quickly and the collected waste disposed of safely. A handle operated release mechanism drops the waste into a neat pile which can then be swept up, using the built in collection tray and brush (not included). A substantial aluminium casting houses very powerful permanent anisotropic ferrite magnets, which retain their power for 50 years. Adjustable for height and fitted with large front wheels and rear castor, complete with collection tray and brush, these machines are extremely manoeuverable and will cope with bulky waste and uneven surfaces.